Saturday, Dec 12 was unseasonably warm; the whole month was. 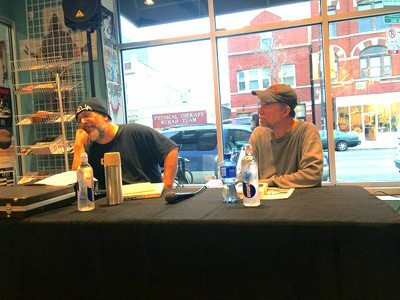 It was 60+ degrees in Chicago while doing a Q&A, book signing/reading session with Joe Carducci (Rock & the Pop Narcotic; Enter Naomi) at Permanent Records. The day before, we did three radio interviews—Lumpen Radio, Que4 Radio, WHPK. It was kinda like those old punky rocky days before the internet gave bands the “excuse” to be lazy sods complaining about Facebook likes. Joe’s books have already delved into that aspect of the 1980s independent R&R life and I’ve got pleny of my own experiences committed to a manuscript in progress, not that anyone would care. Joe’s wised up. His next book will have nothing to do with music. “Stone Male” will be a treatise on the development of the “Western” movie genre as defined by the actors who played the heros, the villains, the immigrants, the Indians. Of course, it’ll also cover the directors who made the formula work.